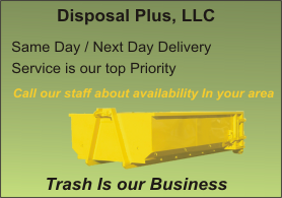 About Disposal Plus Dumpster Service! Disposal Plus, LLC is your source for rolloff Dumpsters and Dumpster Rental in CT and MA, Commercial and Residential, we handle all types of waste management. Disposal Plus is your local source for your home town dumpster rentals. Disposal Plus is committed to providing affordable and reliable dumpster rentals for all and any Dumpster service. Call us and let us earn your business!